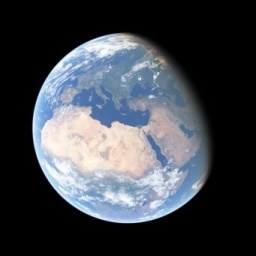 Proland is a C++/OpenGL library for the real-time rendering of multi-resolution terrains (up to whole planets), the real-time management and edition of vector data (representing for instance roads or rivers), the rendering of atmosphere and clouds, the rendering and animation of the oceans, and the rendering of forests. All data are loaded or generated on the fly according to the viewpoint, and can be combined procedurally. For instance the shape and texture of a terrain can be modified using vector data representing roads and rivers. terrains Terrain data can be stored on disk, procedural, or a mix of the two (e.g., to amplify real data with fractal details); Terrain data can be used for anything (elevation, normals, horizon maps, color texture, tree density maps, etc); preprocessing tools are provided to convert terrain data to our internal format, to precompute horizon maps for terrain shadows, etc. Proland comes with precomputed data for the whole Earth, at 500m/pixel for colors and 90m/pixel for elevations. roads Roads are specified with Bezier curves, and are automatically integrated in the terrain shape (to get flat and horizontal roads even on bumpy terrains) and in the terrain texture. The Bezier curves can be edited interactively; the roads are recomputed in real-time after each edit. atmosphere The atmosphere is rendered in real time from any viewpoint from ground level to outer space, while taking Rayleigh and Mie multiple scattering into account. It correctly reproduces daylight and twilight sky color and aerial perspective for all view and light directions. oceans The ocean is rendered, animated and illuminated in real-time, at all scales and for all viewing distances. Our ocean correctly reflects the Sun and the sky light at all scales, yielding very realistic results. edition Any terrain data can be edited on the fly, while navigating in the 3D scene: the terrain shape, its texture, the roads, the tree density maps, etc. forests Forests are rendered with hundreds of thousands of instantiated billboards, in real-time. modularity Proland is made of a core library and of 7 predefined and independent plugins, each in its own dynamic library (DLL). You can easily add your own plugins to add new functionalities to Proland. Proland is now distributed under the BSD 3 free software license, for non-commercial as well as commercial use. This program is distributed in the hope that it will be useful, but WITHOUT ANY WARRANTY; without even the implied warranty of MERCHANTABILITY or FITNESS FOR A PARTICULAR PURPOSE. See the BSD3 License for more details. As a research center, INRIA cannot ensure long term software maintenance, but the main author and a community out of INRIA might help you on, and INRIA might be able to answer or redirect concerning special needs (e.g. development, formation). For both, see contact.